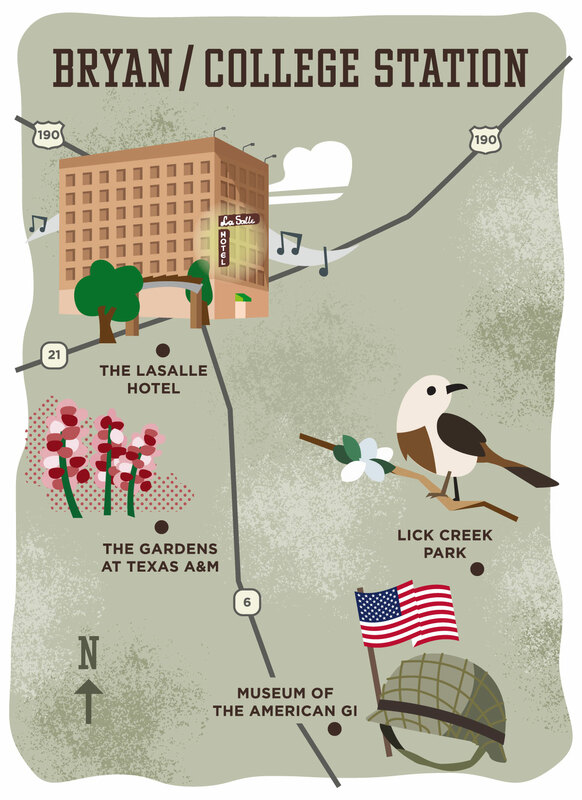 An alumna revisits her alma mater and other delights of Bryan-College Station. Driving in from the west, you see Kyle Field first, rising like a Texas version of the Emerald City behind fields of cotton instead of red poppies. That’s the football stadium for the fighting Texas Aggies at Texas A&M University, of course, a must-see for many who visit Bryan-College Station. Today it holds 102,733 people — many more than it did back in the mid-1980s, when I graduated from A&M with a degree in agricultural journalism. Honestly, nothing looks like what I remember from 32 years ago. Multiuse developments have replaced the mud-covered lots where we used to park our cars, and six-story classroom buildings now top the old open fields of West Campus. Except for the LaSalle Hotel in downtown Bryan, where I’ll unload my overnight bag, most of the places I’ll visit during my two-day jaunt through this more-than-just-a-college-town hadn’t even been sketched out on an architect’s pad when I last lived here. Texas A&M's Kyle Field stands proud and tall in College Station. 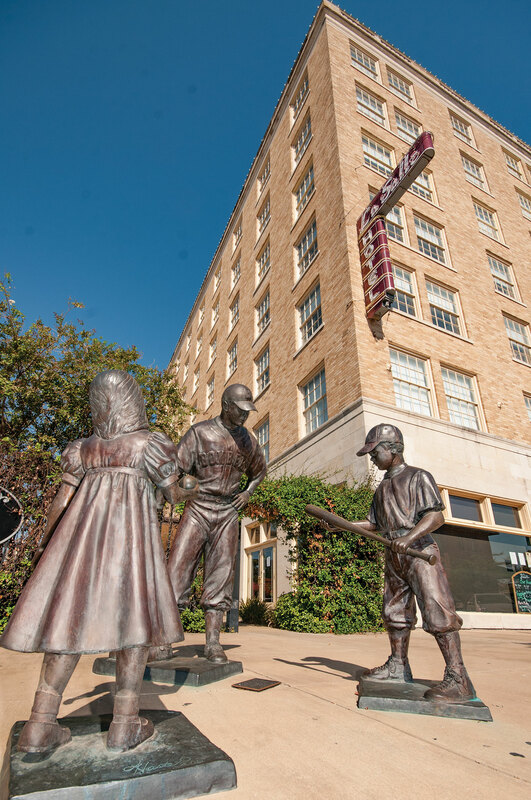 Outside Bryan's historic LaSalle Hotel, a sculpture of the Bryan Bombers pays homage to the 1940s team. “I skip the stadium (12th Man Tours are available if you want a behind-the-scenes look) and start my tour with a stop at the George H.W. Bush Presidential Library and Museum, tucked into a section of Aggieland called West Campus that housed only a few stray buildings and something we called the Pig Farm in my student days. Inside, you can check out the presidential limousine that once carried Bush, pretend you’re a fly on the wall at historic Camp David, inspect a restored 1944 TBM Avenger like the one Bush flew as a Navy pilot and, best of all, settle in behind Bush’s desk in a replica of the Oval Office while a docent snaps your picture. I belly up to the desk — “Finally, I’m in charge!” — then watch as a trio of kids pile into the presidential chair, pretending to field phone calls. Back outside, I follow the footpath around a small lake and over an arched bridge to the burial site of the president, first lady Barbara Bush and their daughter Robin, who died of leukemia at 3. From there, it’s a few minutes’ drive to A&M’s Rosenthal Meat Center to pick up steaks, pork chops and, best of all, a football-shaped summer sausage, the perfect conversation piece for your next game-day party. Meat products procured, I leave my car in the paid parking section of Lot 74 (parking is free on weekends) and walk over to the new Leach Teaching Gardens, the first phase of a 27-acre project, The Gardens at Texas A&M University. The gardens combine natural space and landscaped gardens in an on-campus respite where I find graduating senior Valerie Hadley celebrating the completion of her last final exam — ever — by taking a nap on a porch swing. “It’s kind of a bittersweet moment,” she tells me after I nudge her awake. She attended college later in life, after marrying and starting a family. This lush oasis, she says, provides a place to reflect on how far she’s come and where she’ll go next. 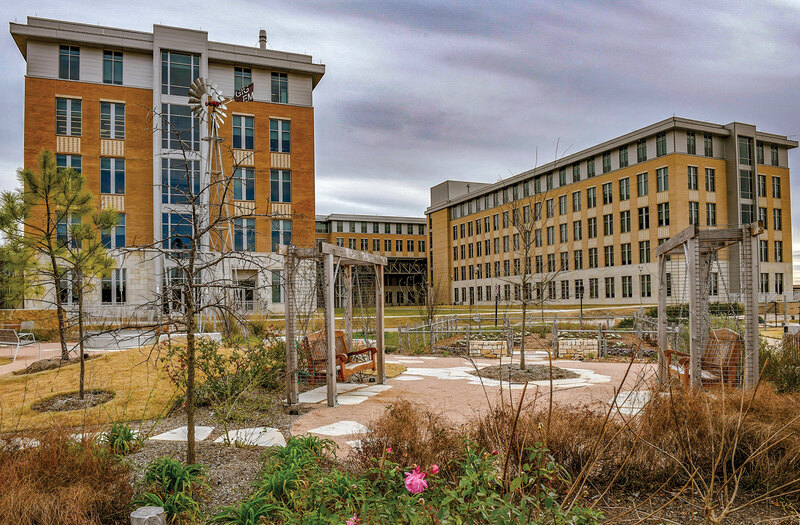 The garden’s overseers love to see the space used this way, says Cady Auckerman, chief of staff of Texas A&M AgriLife Extension, a series of regional agricultural offices headquartered here. So far, seven acres of what ultimately will become a 40-acre greenspace with trails and learning gardens have been developed. Visitors can amble through butterfly and bee gardens and check out pocket-sized green spaces that highlight different parts of Texas, from the High Plains to the Hill Country to the borderlands. The George H.W. 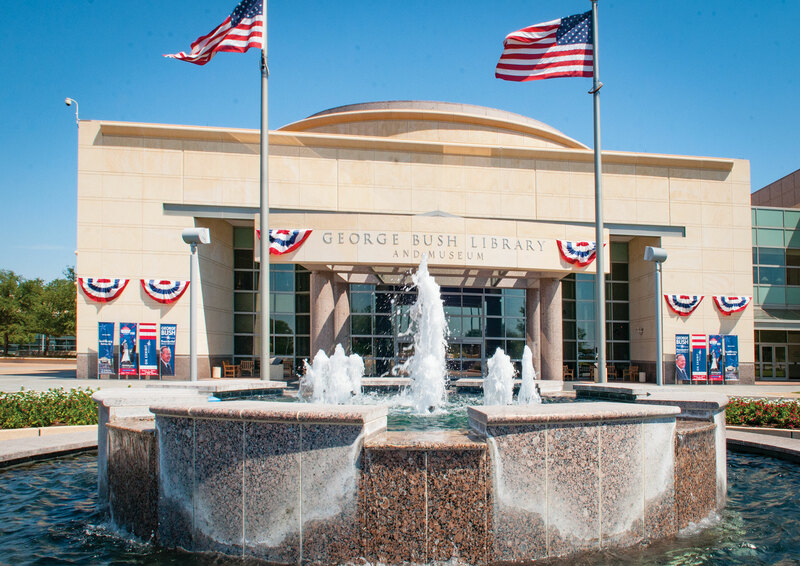 Bush Presidential Library and Museum honors our 41st president. 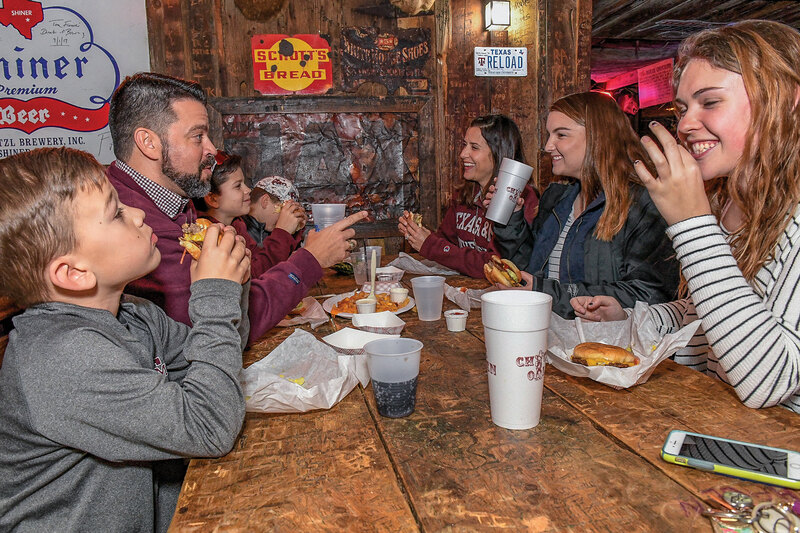 The iconic Dixie Chicken has fed and watered many Aggies over the years. 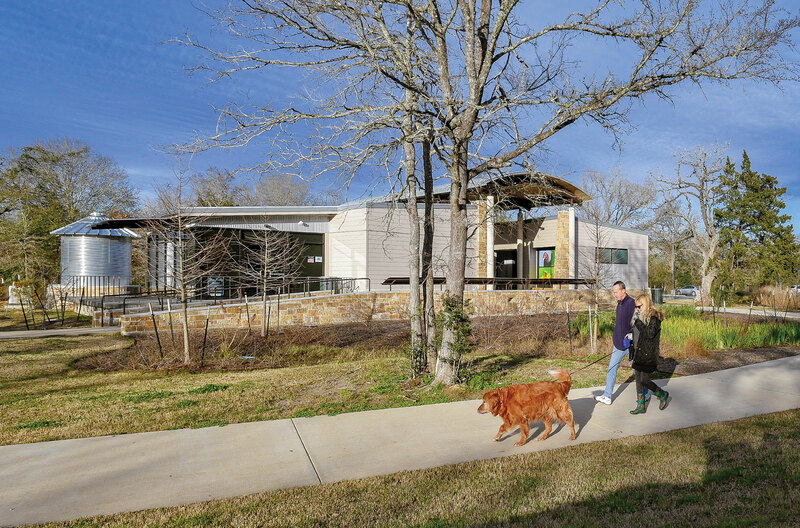 Lick Creek Park's Nature Center, built in 2017, serves as a focal point of the park. A&M's new Leach Teaching Gardens aim to connect people to horticulture. From the gardens, I follow a path toward the Horticulture and Forest Science Building, wandering past the Howdy Farm, a student-run sustainable farm, along the way. Produce grown here is sold at the Brazos Valley Farmers Market in Bryan. The lobby of the Horticulture Building hosts a series of rotating exhibits, including occasional displays by the university’s Benz School of Floral Design. I can’t resist peeking into a lab, where students are busy perfecting arrangements of potted plants. 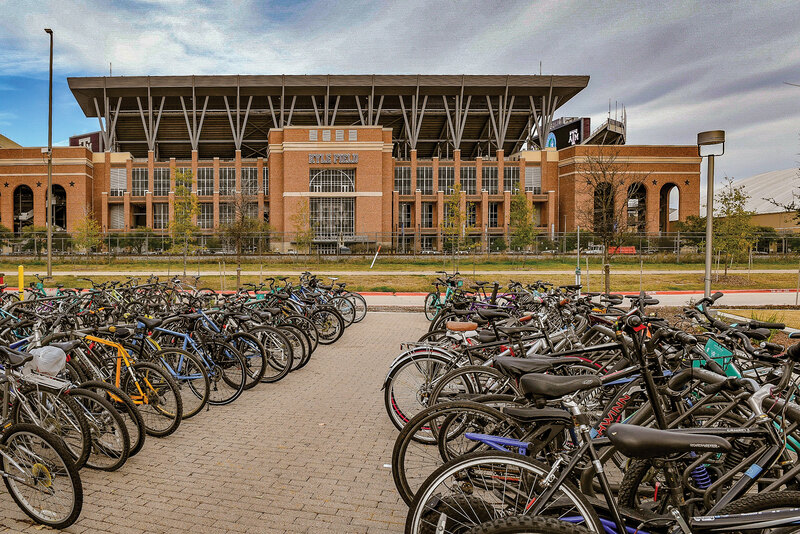 From here, it’s a quick dash across the railroad tracks to the Memorial Student Center, known by students for decades as the MSC, the hub of student life and home to a bookstore that peddles umbrellas, sweatpants, hats, pajamas and backpacks for humans, plus T-shirts for dogs, all emblazoned with the Aggie logo. Next on my list is the row of businesses along Northgate. I want to make sure the Dixie Chicken still stands (it does), and reminisce about two former students: musicians Lyle Lovett, class of 1979, and Robert Earl Keen, class of 1978. They famously spent hours strumming guitars at an old rental house that once stood not far from the Chicken; that’s where Keen and Lovett penned the song This Old Porch, which compares the decrepit wooden home’s music-filled porch to, respectively, a Hereford bull, a plate of steaming enchiladas from a hotel (more on that later) and an old movie theater in downtown Bryan. So, yes, I’m heeding the call of that Aggieland anthem and driving to Bryan to round out the narrative. There, I pull up at the LaSalle Hotel, home of the greasy enchiladas “with iced tea and a waitress who will smile every time.” I did leave more than a “quarter tip” on my bill, though. With the university and all the action that surrounds it, College Station seems to get most of the attention, but Bryan deserves a closer look. It was originally settled in the 1820s, and the first railroad came through in 1859, about 20 years before Texas A&M College opened. Today, a dozen bars and restaurants operate in downtown Bryan, and the LaSalle Hotel, which opened in 1928 near the city’s train depot, bustles with activity. I check into the hotel. According to local lore, Elvis Presley stayed here in 1955, when he was in town to perform at the Saddle Club Rodeo Arena. The hotel later closed, and subsequently served time as a nursing home and later an apartment building before it was renovated and reopened as boutique accommodations in 2000. Today, the hotel’s restaurant, Downtown Elixir and Spirits, serves up food with a Cajun flair — there are no greasy enchiladas on the menu, as referenced in This Old Porch. But trains still run by, which is why you might want to pick up a pair of complimentary earplugs from the front desk before you crawl into bed. The next morning, I grab breakfast, then amble through downtown. If you’re in the market for vintage furnishings, dishware, jewelry, toys, books, artwork or collectibles, you’ll find plenty to explore. Don’t miss the Corner of Time antiques and collectibles mall on North Bryan Avenue, where you can order a hand-mixed phosphate at the old-timey soda fountain. I still have two more stops on my ticket before I head back home, and both take me back over to College Station. First, I drop by Lick Creek Park, a 515-acre oasis with 5 miles of trails for hikers, mountain bikers and equestrians. The city acquired the parkland more than 30 years ago. In 2017, a nature center was added complete with an amphitheater, restrooms and classrooms. From there I head to the Museum of the American G.I., which opened four years ago on Texas Highway 6. “Most people come for the tanks,” says museum co-founder Leisha Mullins, who escorts me through the displays, which include seven working military tanks that remind me of metal rhinoceroses. During a living history weekend held each spring, visitors can hitch a ride on a tank and watch battle re-enactments. The museum’s Texas Vietnam Heroes exhibit features 3,417 dog tags — one for every Texan killed or missing in Vietnam. There’s also a large collection of women’s military uniforms, a Vietnam-era Cobra helicopter and river patrol boat and dozens of World War I and World War II propaganda posters, including one that shows a Navy sailor straddling a torpedo in an illustration, a la Dr. Strangelove. By lunchtime I’m still craving those enchiladas, so I hop back to Bryan, where I make one last stop at Casa Rodriguez Restaurant, also on North Bryan Avenue. They’ve been in business since 1978, and serve up an array of enchiladas, including ones built with spinach, sour cream and bacon (yes, bacon!). I’ve seen so many new places that it’s nice to wrap things up with a hot plate of food at a well-loved restaurant that’s served generations of customers. It’s the perfect bookend to a trip that’s reintroduced me to a pair of cities I once knew well.